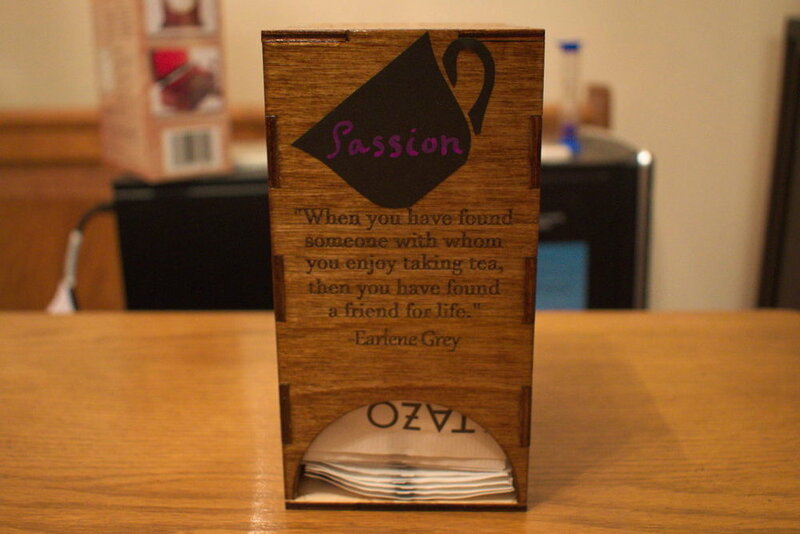 These tea holders were an idea that I had over the summer, and saved to use as a Christmas present. I designed 5 different tea holders + 1 hot cocoa holder so that they can fit most standard tea bag/hot cocoa sizes. It's not shown in the pictures, but the back piece is designed to lift off so that you can replace the tea from the back when you run out. I scoured the internet for my favorite tea related quotes and picked my favorites. I also decided to add labels to each one using adhesive chalkboard material, so that you can write what tea each tea holder contains. In this tutorial, I detail the process for laser cutting and constructing these. Hope you enjoy! Download the included laser cutter templates below, and laser cut the designs. -The file units were in centimeters (for if you need it when importing), and my 2nd picture in this step has a reference piece to make sure that your file imported at the correct scale; the length of the top rightmost piece of the hot cocoa holder should measure 9.5 cm. Sand the plywood with a fine sandpaper (I used 220 grit), then stain the wood with 2-3 coats of wood stain. Glue each piece together. 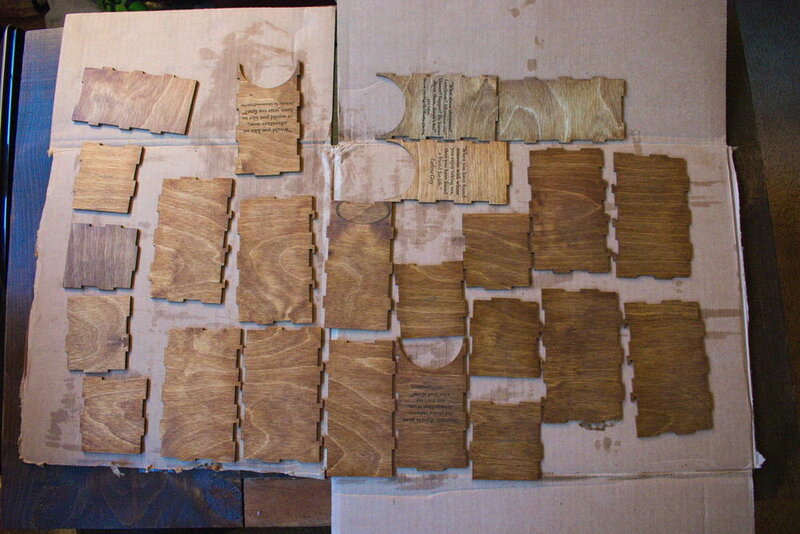 I recommend a quick drying glue (<30 seconds) because you have to hold them in place. 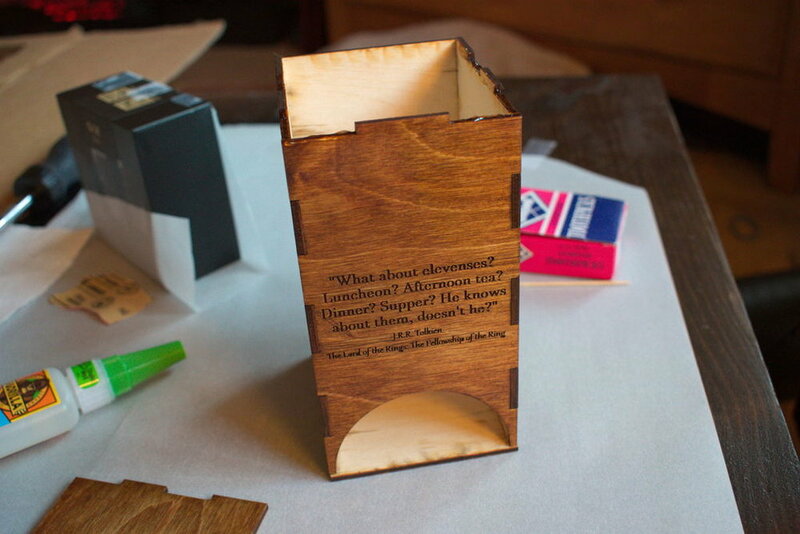 -Make sure to not glue the back piece on, as this piece is meant to be able to pop on and off to replace the tea bags. 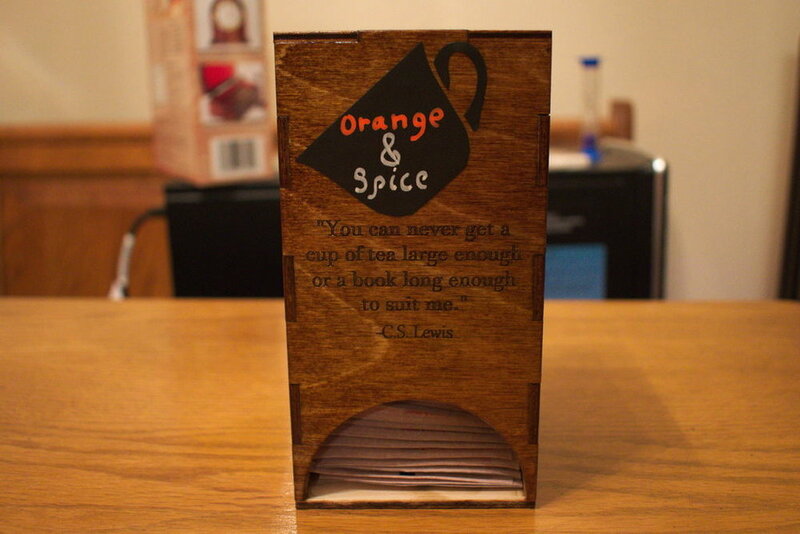 -Prop them up so that the finish doesn’t dry/stick to whatever is under the tea holders. Cut out the design you want for the labels (I found that a tea cup looks perfect), and remove the adhesive backing from the adhesive chalkboard and stick them on the tea holders. Then you can write on the labels using chalk or a chalk marker. -If you're artistic, you can can probably create your own nice design, but if not, you can find a template online by searching for "vector teacup" (or similar for the design you want), printing that out, and using that as a template for cutting the adhesive chalkboard. And you're done! Hope you enjoy your new tea holder set.